All the climbers you see here are wearing rubber-soled gym shoes. Note the nail-scarred footholds in the first picture. "[Holland] had lately become a devotee of 'rubbers' (gym-shoes), even on wet ground, where most climbers - bar the latest 'tigers' - find that they slip as treacherously as on ice. The rubber shoe had just come in  and divided the climbing world as sharply as later the question of oxygen or no oxygen for Everest was to do. 'Dangerous and dishonest, and quite out of the true tradition of the sport', said one party. To which the other replied, 'what about the nails in your boots, the rope and your carefully chosen ice-axe? Equally they make climbs much easier.' The same dispute arises with every technical innovation which in any way changes the standard of difficulty." - Dorothy Pilley in Climbing Days (1935). 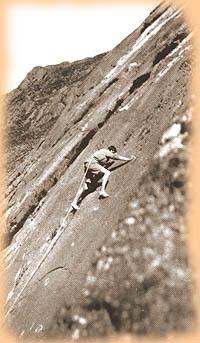 In the mid 1930s, Pierre Allain created the first shoes designed for rock climbing and having rubber soles. 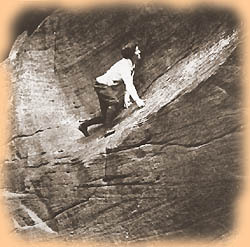 Pat Kelly was one of very best rock climbers in Great Britain just after World War I. 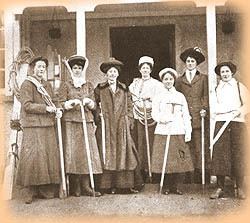 At that time existing climbing clubs were largely male bastions and a female climber had difficulty breaking through the gender barrier - particularly organizing and leading climbs - although the situation was worse in Germany and would continue to deteriorate as the National Socialists took power (even though women under that regime were encouraged to be very physically active). ". . . It was a pity Pat Kelly was not there, but she, as so often, was leading another woman up a neighboring climb. 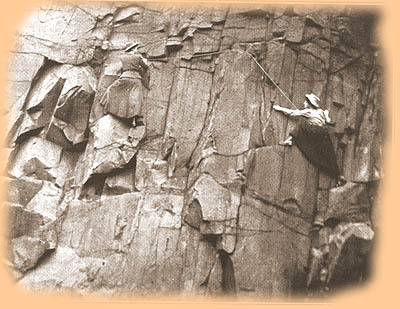 This passion of hers for independent women's climbing was just then, in fact, bringing the idea of the Pinnacle Club into actual being. . . . But from the idea to the reality seemed a long step, and without Pat Kelly's powers of inspiration it might have been indefinitely delayed." - Dorothy Pilley in Climbing Days (1935). 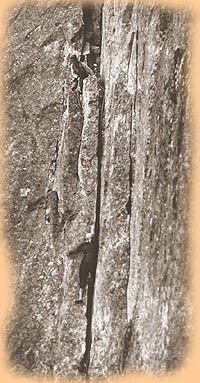 Pilley continues: "Solitary climbing was a specialty of Pat's. She enjoyed it for the peculiar heightened consciousness it gives, and she was so complete a mistress of the craft that with her even very difficult solitary climbs were perfectly justified." Kelly herself had this to say: "Perhaps we got tired of being taken in hand by men climbers, kind and helpful though they might be, perhaps we sympathized with the would- be climbing woman who had no man friend to take her in tow....As in other walks of life, women wanted to find their own feet: it was very splendid for some women to be always able to borrow crutches in the shape of a man's help, and a man's rope but it is even better we have feet of our own and can climb some things as well as a man climber." 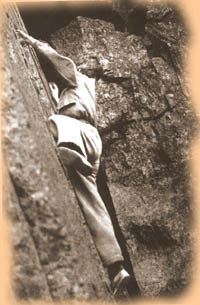 H. M. Kelly spoke of Pat: "My wife commenced her climbing career at the beginning of 1914, so that she had for some time found her feet when the Pinnacle Club was formed. Most of our gritstone climbing was done solo, hers particularly, from choice, as she wished, to use her own words 'to develop her own technique in her own way'. 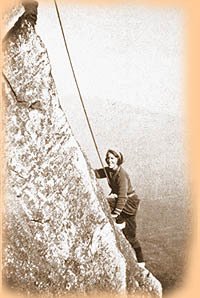 Perhaps her most outstanding climb was done on a Sunday in 1921 when she climbed solo Jone's Route from Deep Ghyll to Low Man as well as Professor's Chimney. 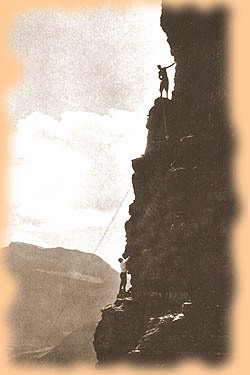 I wasn't there at the time but Holland, who was sitting on top the Scafell Pinnacle with others, describes in an article he wrote afterwards in the Fell & Rock Journal, their consternation on seeing this lonely figure coming up the arete." 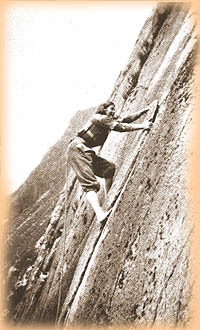 It was a great misfortune that an accident on loose rocks on Tryfan ended her life in 1922, when she was at the height of her powers. 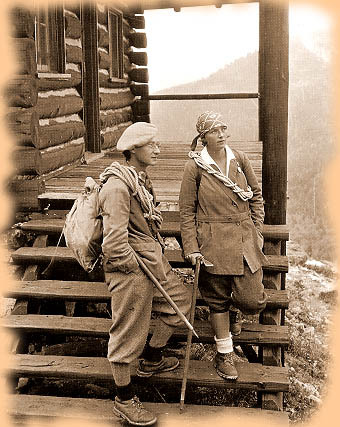 Dorothy Pilley (1893-1986) was an excellent climber who, like her friend Pat Kelly, believed in the capacity of women to organize and lead challenging climbs. She married I. A. Richards, who became a world-famous scholar. 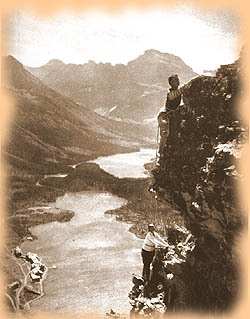 She and her husband traveled and climbed together extensively. Pilley's book, Climbing Days, is a delight to read - written in an exuberant and entirely wholesome style. To Be Continued/Revised . . .